When you grow up with something as the constant backdrop to your life, it’s easy to forget as an adult that not everyone else shares your instinctive knowledge of the subject. My dad is a blacksmith, he’s now retired, but as I was growing up his very active forge was in a workshop next to our house. This is the second part of a series based upon that experience, exploring blacksmithing for people who have maybe always fancied a go at the anvil but have little idea where to start. 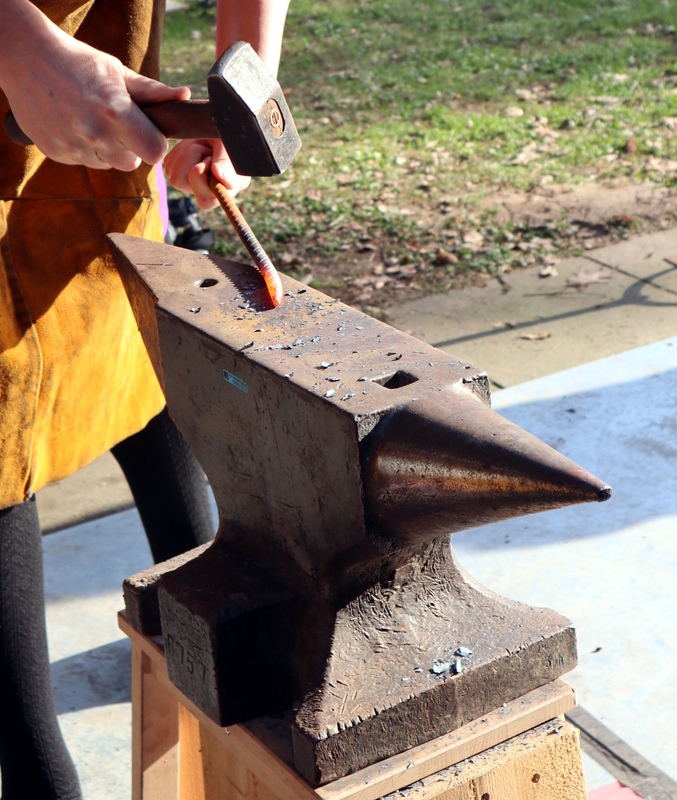 Having considered the hearth in our previous outing, it’s time to turn our attention to what is the signature piece of blacksmithing equipment: the anvil. This has the function of providing a high-mass hardened working surface against which metal can be forged, and it has a distinctive shape with various parts for particular metalworking tasks. There are many minor and major variations of anvil design depending upon where in the world your anvil hails from, but since my experience comes from the English counties, the anvil I will be describing is the pattern you’ll find in the British Isles. The various parts of an anvil. Gerald G (CC0 1.0). A blacksmith’s anvil is a large block of iron, which is to say forged steel or in some much older anvils wrought iron, but sometimes and usually in cheaper anvils, cast iron. It has a flat rectangular top surface for working metal referred to as the face which is made of hardened steel, on many anvils this can be a separate piece welded to the top of the body of the anvil. At one end of the face is a conical tapered point referred to as the horn which is used to form curves, and at the other is as squared-off edge referred to as the heel, which tapers away underneath towards the base of the anvil. 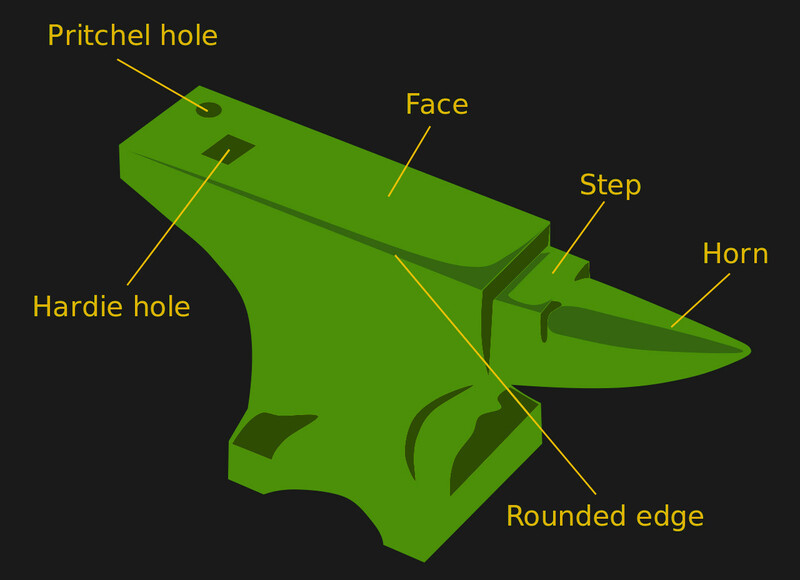 In the face towards the heel are usually two holes, a large square opening called the hardie hole which is designed as a receptacle for tooling, and a small round one called the pritchel hole which is designed as a place to use a punch or similar tool on a piece of work without damaging the face of the anvil. You will sometimes see anvils with different shapes, perhaps with protrusions on their sides or with a horn at each end, these will either be of an overseas pattern or designed for a specific task such as shoeing horses. There is a “feel” to a good quality anvil, if you strike it with a hammer. This is something that you will understand from experience once you have tried it, but on the ideal anvil there would be a ring sound and the hammer would rebound as though bouncing. It’s a good indication of the quality of a surface for use as an anvil, and it’s one you can readily appreciate if you test a few surfaces. Compare the note and feel of a hammer blow to a good anvil with that of hitting a piece of cast iron such as a scrap engine block, or hitting a piece of steel, and what you will learn will help you judge the quality of any anvil you consider. The RevSpace anvil is significantly different in shape to the British anvils I am used to, I was told that it follows the German pattern. As a youngster growing up around a forge, the first thing I learned is that the face of the anvil must be treated with care and only used for hammering of hot metal, never for drilling or the use of a punch except when over the pritchel hole. It is possible to excessively wear or even break an anvil by using more force than it can take, thus it is important to use an anvil of appropriate size for the hammering to which you will subject it. You will see plenty of small bench-top anvils, these are too small for all but the lightest of this kind of work. Ideally something a bit larger should be in your sights, perhaps something like the 50 kg (110 lbs) anvil my dad used for portable work. Where do you find an anvil? Obviously a blacksmith supply company will happily sell you a good-quality new one for a suitably hefty price. It can be tempting to go for a much cheaper alternative that you might see from a mass-market tool retailer, for example. Any anvil is better than no anvil, but I would always counsel the buyer to consider why a new anvil might be cheap, and whether it might be a very low quality piece of cast iron and a poor purchase decision. If you’re considering any anvil, always go for the best you can afford as it will very likely serve you for the rest of your life and your offspring for their lives too if you are lucky enough to be able to pass it on. Our community has few problems considering many hundreds of pounds an acceptable price for an oscilloscope or a laptop computer, an anvil should be considered in the same light but with the added bonus of far less depreciation. Of course, it’s not impossible to find neglected second-hand anvils. The problem is as always one of perceived worth, so you may find top dollar demanded for something that is worn or even broken beyond repair. Good quality older anvils are not intrinsically better than their modern quality equivalents simply because of their age, and while it’s cool to own something that’s been worked on for centuries you will not somehow inherit the skills of those who used it before you by doing so. Be careful not to be sucked in by the romance of owning an aged anvil if you are being asked to pay more than a brand-new one of the same or better quality, and especially not if what is on offer is damaged or worn. It’s not uncommon to find something whose face resembles the surface of the Moon on offer for the cost of a trip to the Moon, so be prepared to say no. If the anvil face is not flat, if the face is broken, cracked, or coming away from the body, or if the heel or horn are broken, walk away unless the anvil is very cheap or even free. It is possible to find a bargain for the cost of a repair if you know what you are doing, but you should beware of time and money pits. You are better served in many such cases buying a new one. Of course, you may just get lucky and find someone who simply sees a large block of iron as a huge removal problem, but it’s more likely you’ll have to hunt for one whose price is fair rather than eye-watering. I’d suggest starting by asking around in hope of that lucky find, and haunting your local machinery auctioneer. A home-made anvil crafted from a piece of rail. Relvax (CC BY-SA 2.0). Happily it is not impossible to make your own anvil if you possess a reasonably well-equipped metalwork shop. You may not be able to create something with as much mass as a commercial anvil, but if you are starting out you should certainly be able to come up with something. 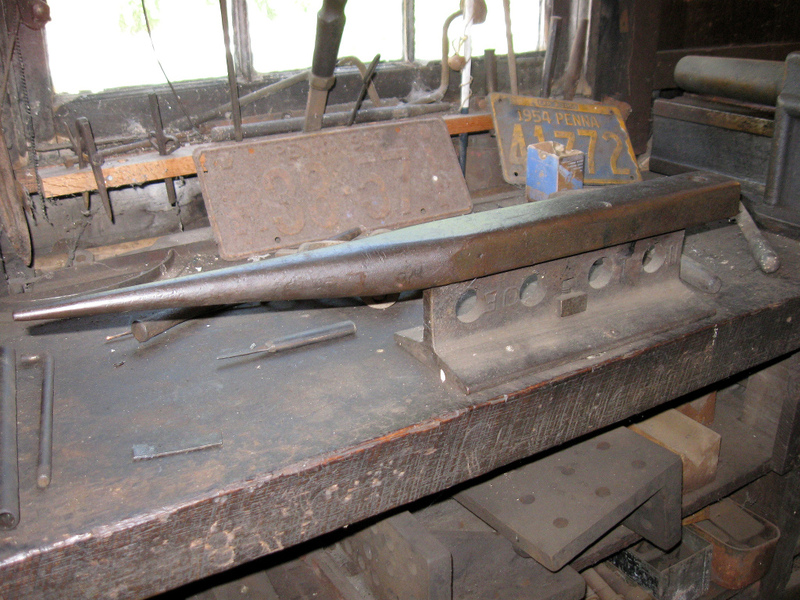 The classic small home-made anvil is produced from a piece of rail cut to form a horn at one end and usually with a piece of hardened steel forming the face welded on the curved surface where the train wheel would run. At a pinch you can even do work on almost any large piece of steel stock or very thick plate, as long as it has a significant mass it should be able to be pressed into service. If you ask around engineering shops for some of their weightiest offcuts you might be able to find an impromptu anvil for a surprisingly low investment. Avoid cast iron though, it is brittle and can easily shatter when hammered. If you were expecting this page to dive right in and start with the forge work, then sadly we must disappoint you. Instead it makes sense to keep going through the basics of what you should find in a forge before we take you to the metal. This is by no means the sum of the blacksmith’s equipment, and we’ll continue it in our next installment with a look at some of the other tools in the blacksmith’s arsenal as well as talking about safety equipment. Then we’ll be ready to take you into the forge and show you some work.